After about 32 hours inside the barn my "BIG'S" are happy to get outside. Fresh new paint on the walls of the farm house. The color is Sherwan Williams Argues Pear. Feeling very blessed to have such a nice big barn for my three boys. The Belgians prefer to be outside, but they are riding out the blizzard inside. With the deep freeze upon us, we are working inside the farm house. We are freshening up the paint and organizing. Had my grown Son home from Mass. last week to start painting. 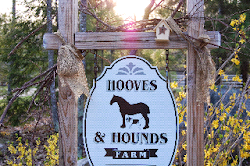 Did you know Hooves and Hounds Farm is a Certified Wildlife Habitat ?